If Governor Andrew Cuomo can be taken for his word, the wheels of shale gas development will soon begin turning in New York state, without legislative involvement. Last week, Cuomo said the long-awaited policy document necessary for permitting high volume hydraulic fracturing wells would be issued “shortly” and, he added, while the legislature is not session as to avoid “a political discussion.” Cuomo has been promising to push forward with the contentious issue of shale gas development and fracking in particular since he took office in 2010, so it’s hard to know what “shortly” means. But stakeholders on both sides are taking his latest remarks seriously. Grass roots anti-fracting groups have turned up the heat with their demonstrations, phone calls, and letter campaigns targeting elected officials. Drilling proponents have fallen into camps both critical and supportive of Cuomo’s recently reported approach to limit the debut of fracking in New York to certain areas, based on the lead of local governments. But drilling supporters are also eager to see some sort of policy that would allow permitting to begin. That is expected to happen through the final SGIES (Supplemental Generic Environmental Impact Statement), which includes the state DEC”s environmental review of shale gas impacts that has been in the works for four years -- the document Cuomo says will be released “shortly”. Last week, during an interview with the Albany’s WGDJ-AM, Cuomo indicated he was sticking with the idea of letting localities, rather than state government, determine how fracking operations will play out in New York. To do this, the state would count on a process of natural selection, more or less, to approve permit applications, talking into account where local governments want shale gas development for economic reasons, and where they (or the state) wants it banned due to public health and safety concerns. “Many times a town or a city will say, ‘That’s nice, I’m glad you think that Albany, but stick to Albany, we know better. Government closest to home knows the best.’ “ Cuomo said. Reading a politician is tricky, but I don’t think I’m going too far out on a limb by characterizing Cuomo’s approach as an attempt to reach a compromise in the highly polarizing issue of fracking. Having been in the news business for some time, I’m also keeping in mind the political strategy of releasing controversial material during a time when the mainstream media, activists, and politicians are distracted. Often this means late on a Friday, during the height of summer vacation, and/or when legislative session is out. In short, upcoming summer months square with that scenario. In search of more clues as to where and when shale gas permits will be issued in the Empire State, though, I followed the lead of industry watcher and blogger Andy Leahy, and turned to the New York State DEC’s data base that tracks permitting activity. My take is similar to Leahy’s, and it’s really not a big surprise. The companies are setting their stakes down in the south central part of the state, over the richest part of New York’s Marcellus Shale and near major pipeline infrastructure. Chenango County is one strategic spot. Here Norse Energy, the Norway firm, has been developing the Herkimer Sandstone formation (which does not require frackng) for a decade, and it intends to use its landhold and hardware to begin exploring the Utica and Marcellus shales as it works it’s way south toward the Millennium Pipeline in Broome County. I count 20 Norse permit applications in Chenango County for either the Marcellus or Utica, most of them from this year. If Cuomo releases his permitting document, Norse may also be among the first out of the gate in Broome County, where it this year applied for five shale gas permits in the town of Sanford. Chesapeake, of Oklahoma City, is also vested in Broome County, with a dozen applications in the Town of Fenton from 2009. In Tioga County, Talisman, a Canadian company, has 11 active shale gas permits applications in the Town of Candor from 2008 and 2009. Carrizo, a Houston company, filed one this year in the Town of Owego. But while these and other companies are positioning themselves to be among the first to sink shale gas wells in the Empire State, the regulatory and business atmosphere remains unsettled. Permits will likely have to be updated after the SGIES is finalized. Environmental groups, such as EarthJustice, have threatened to stop the industry from advancing with challenges to the legal integrity of a state policy that allows fracking to be tried in some areas while banned in others on environmental grounds. Moreover, the price of natural gas remains low, and some shale gas ventures in New York are languishing. They include a proposal by eCorp to get around the SGIES by using propane rather than fracking fluid to stimulate wells in Tioga County. The proposal, announced in late May, would give landowners a working interest in well operations rather than up-front lease payments. So far, this pay-me-later versus pay-me-now proposition has not generated much enthusiasm from landowners, and there is no deal on the immediate horizon. Meanwhile, Chesapeake has sold mineral rights to 160,000 acres in the Finger Lakes region to Minard Run, a family-owned company in Bradford, Pa. Minard plans to drill exploratory wells into conventional formations over the next 18 to 24 months, with a “high probability” of also exploring the Utica Shale using unconventional horizontal drilling and high volume hydraulic fracturing in Cayuga and Seneca counties. This is in a region with strong drilling opposition, and could be, under Cuomo’s strategy, excluded from the state’s initial round of permit approvals. Drilling proponents have questioned the soundness of Cuomo’s approach that allows some state residents to develop their mineral rights, but not others. Meanwhile, the legislative picture remains turbulent during an election year. Many fracking bills were in the pipeline as the legislative session ended last week, but none made it to the floor, indicating a reluctance by lawmakers to attempt to legislate a process that is still in the works administratively. The legislature can convene at any time, and would be likely to do so if the final SGIES – along with issues about where fracking is or isn’t allowed -- raised enough political concern. While any attempts to seriously curb or ban shale gas drilling is not likely to pass the current Senate, controlled by pro-drilling Republican leadership, it will be interesting to see whether the state’s policy, should Cuomo finalize it prior to elections, will stand up to the political test that will come on Nov. 6. I am wondering what mechanism would be used to determine which towns want to be fracked. Does failure to have passed a ban or a moratorium over the last couple of years constitute a willingness to be fracked? Does passage of a pro-drilling resolution by a town board that did not bother to seek public input and whose members may have conflicts of interest constitute a willingness to be fracked? Shouldn't there be public hearings in a town before the fracking question is settled for that town? And what is the time frame? Gov. Cuomo seems to be putting the final responsibility for fracking on the shoulders of town boards whose members must now act very quickly to make a determination on their towns' policies on fracking. Some of these boards having been coasting along, waiting to see what the DEC comes up with and avoiding passage of a ban or moratorium because of fears about being sued. Now, suddenly, the decision seems to be in the hands of the town boards. Will there be any sort of grace period during which appropriate pubic hearings can be held? And what about situations in which Town A wants to frack, but adjoining Town B does not want to frack? 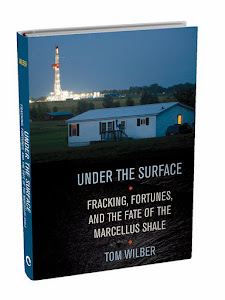 Won't Town B be likely to suffer some of the negative impacts of fracking? And won't court battles and general ugliness ensue and rip the Southern Tier apart? Oh wait--I forgot--Albany doesn't seem to care about the Southern Tier--that's why we're in the fracking crosshairs. I think Gov. Cuomo's plan is a way of shifting the ultimate responsibility for a very difficult decision from his own shoulders to someone else's shoulders--it is not the sort of thing that a great leader would do. We should not be testing dangerous practices by trying them out in impoverished areas that may agree to the testing simply because they are desperate for cash--or because their town boards gave the process the go-ahead without bothering to consult the citizens they supposedly represent. I'm pretty sure that this is so morally obvious that if the situation were explained in age-appropriate terms to a typical 5-year-old child, the child would make a more morally defensible decision than our governor seems to be making. The Southern Tier is poor because it's been at the mercy of Liberals in Albany and their economically horrific decisions over decades for quite long enough. Fracking has been used since 1948, it's use has exploded the last decade in particular since 2009. I think we'd know - you Luddite - if it was going to cause serious problems. And they'd have to be very serious indeed to justify keeping my people poor one second longer. Fracking is well past the testing stage. Right now PA has a boom, we're still bust. As you said - impoverished. We can't all get checks from the State. Dangerous practices..testing ...keep playing on peoples fears and ignorance. If the youth there could not flee and were stuck in the Southern Tier...this would be a very different game.